Meet Setanta the Saluki. Setanta is a stunningly handsome dog, and his personality matches his appearance. He is a lovely quiet and gentle dog…his aim in life is to be with people and he is at his happiest when he is in the kitchen with the volunteers at our shelter, getting lots of attention and lots of treats. He loves the couch and will find a warm sunny spot inside the window where he can both sunbathe and take treats at the same time. He is well happy to be taken for a walk and walks with great interest when taken out around our fields. He loves other dogs and will do well in a home either where there is another dog or where there is someone at home with him for a good part of the day. He would love nothing more than a nice bed by a warm fire where he can be with his family and have his ears stroked . He is house trained. Have you a place in your home for this beautiful dog? 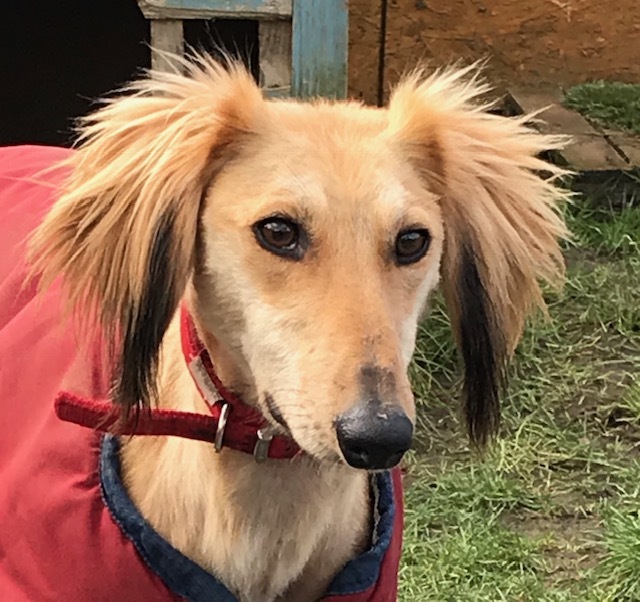 Setanta has been chipped and vaccinated but has yet to be neutered as he is still very thin…his coat was also in bad condition when he came to us but is improving and will be beautiful once he fattens up and gets plenty of good quality food. He is living at our shelter where he can be visited between 1-3pm, Monday to Saturday. With expressions of interest please contact 0871279835 (reasonable hours only please) or email kwwspca@gmail.com. To complete an adoption a medal for the collar and a dog licence are required, a home visit also applies. Setanta is an Olympic high jumper…secure, high surrounds required.